Precor 9 23 Treadmill Review - It's Time To Get Walking! Are you looking for a new treadmill you can use at home? If so, there are a number of great options on the market. In fact, the sheer number of residential treadmills can be so overwhelming that it can be confusing to choose which one to go for. There is one brand, however, that has stood the test of time: BladeZ Fitness. In the early 2000s, the brand produced commercial treadmills, with advanced features such as a television, helping it become popular. Now, BladeZ focuses on residential models that can be folded to save space but are not lacking in terms of functionality. Right now, BladeZ Fitness has three models in their home treadmills collection: the T300i, the T500i and the Synapse ST7iB. All of these models can be folded to save space in your home. They also have a lot of features that make them adequate enough to make your workouts intense and varied. All three models, however, lack in advanced technology found in luxurious treadmills. Each treadmill has a 3.0 or 3.5 horsepower motor, perfect for both runners and walkers. Each unit also has a 12% incline, allowing you to kick things up a notch and make your workouts a little more challenging. All models make use of the i.Concept technology, which enables you to access all the workout apps you want. It allows you to connect your Apple or Android device to the BladeZ treadmill via Bluetooth. The following is a breakdown of all the features of the BladeZ treadmills. The i.Concept technology used in all the models of BladeZ treadmills is very similar to the technology found on other commercial treadmills. The three models, however, only have traditional LEDs, unlike luxurious units which are equipped with touchscreens. You can choose from 15 to 16 different programs depending on your model of choice. Each program consists of 10 challenge levels and some even use heart rate control. The T500i is also equipped with a body fat calculator. As mentioned, all of the treadmills under the BladeZ collection have either a 3.0 or 3.5 HP motor. The motor is under lifetime warranty for residential purposes. Noise wouldn’t be an issue as you can barely hear the motor running. You also wouldn’t have any problems during speed changes. The T300i is considered a walker’s treadmill as it is capped at only 10mph. The T500i and the Synapse ST7iB, meanwhile, have a speed limit of 12mph. These are fairly decent numbers, especially if you’re just a casual runner. Some advanced runners, however, might find this too limiting. Each treadmill makes use of an advanced cushioning called the Orthopedic Active Flex. This offers a heavy-duty shock absorption in the landing zone and a stable push-off area in the back which helps improve your endurance and efficiency. Many home treadmill users look for units with an incline. Running on an incline is a simple way to intensify your workouts, target multiple muscle groups, and relieve stress from your knees. Each unit of BladeZ treadmills has a 12% incline at maximum. The automated inclines are under warranty for three years. The BladeZ treadmills can be folded, enabling you to conserve a lot of space in your home. The largest model, the T500i, only measures 56’ L x 35’ W when folded. The other units are slightly smaller. The T models are equipped with a USB port and speakers so you can play your MP3s. They also have a cooling fan, a smartphone or tablet rack, and a beverage holder. The Synapse, however, does not come with a cooling fan. Contact heart rate grips can be found on all units as well. There is also a removable safety key which enables you to stop the unit from operating quickly. The frame and motor have lifetime coverage for residential use. The parts and other extra items are covered for three years while labor has only one year coverage. 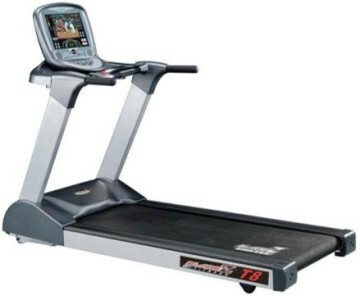 BladeZ treadmills are a great buy for those who are looking for a reliable home treadmill that isn’t too expensive. They do not have highly advanced features commonly found in luxurious models, but the i.Concept technology should be more than enough to help anyone come up with an effective running program. The 12% incline and advanced cushioning also allow for varied and safe workouts.